Here at Netcom 92 we have years of experience working closely with teachers and pupils across the whole of the UK. From the point of receiving your initial requirement, we do the measurements the design, the plan and the drawings. Netcom would then go through the selection of material and equipment throughout the build and installation. Designing an ICT suite that makes the most of the available space and enhance teaching experience. We include a detailed design service completely free of charge within our pre sales consultation. There are a huge number of benefits with using a single contractor for the entire completion of your ICT suite. Using Netcom for the entire project will bring together a number of our services resulting in an overall cost saving. The biggest benefit of using Netcom for the entire project completion is the added benefit of free project management. Netcom assign a project manager to every project which ensures a smooth installation programme and also provides the client a single point of contact for the duration of the project. 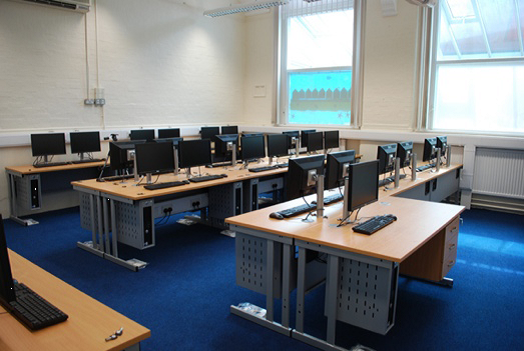 Making the best use of the space that’s available is essential to ensure the best environment for the teachers and pupils so our benching and desking solutions are always bespoke and designed for your school or college ICT suite needs. Don’t give yourself the headache of managing multiple contractors when you can use Netcom to carry out every stage of your project. 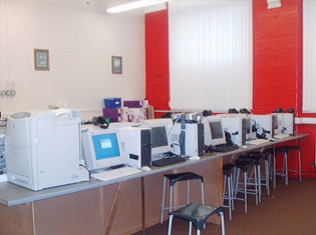 We finalise every part of the project within our pre sales consultation service so when the installation programme starts the school can have the assurance that your ICT requirements will be completed within the desired time scales and also completed with minimal disruption to you, the school and staff. 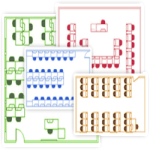 The cad drawing also includes data and electrical outlets to suit each floor plan. 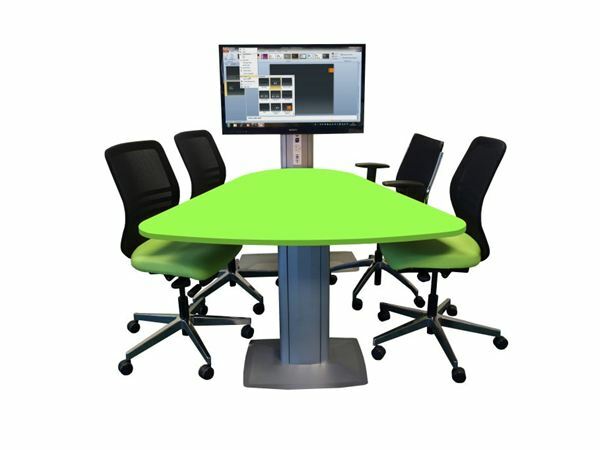 Once the plan and the design has been agreed, Netcom 92 would then give the school or college different benching or desking options, from our standard ICT desks to our versatile flip screen desks or if you’re looking to work as a part of a group the collaborating desks are great. 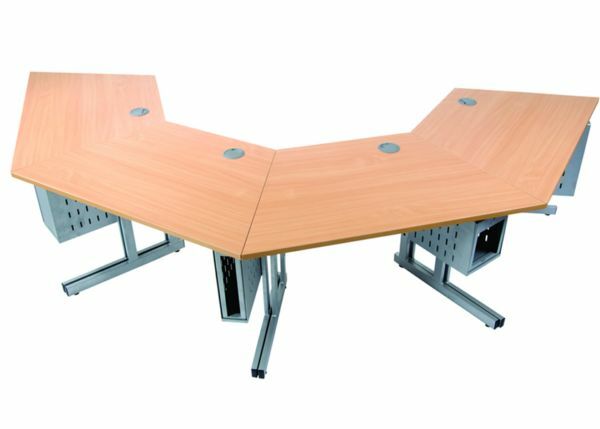 If you’re looking for some bespoke benching to make the most of your available space, Netcom 92 still offer a completely free of charge pre sales consultation. 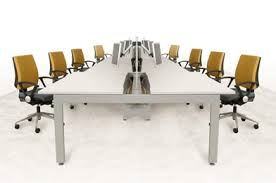 Our benching can be used for full ICT use and non ICT use. 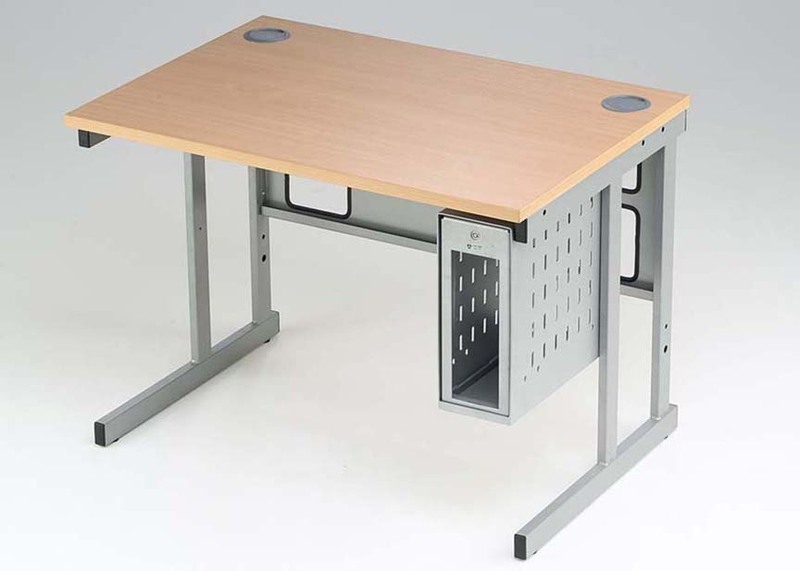 Our benching can be incorporated with security devices such as monitor arms and pc enclosures. All our designs and room plans are created on our cad software. We know that every schools requirements are different so we offer our pre sales consultation service completely free of charge. You will be provided with room plans and products that fit your individual requirements perfectly. 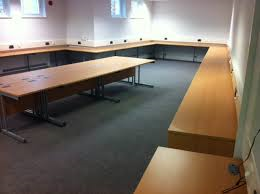 No matter what size or shape your room, we can provide a suitable solution to meet your requirements. 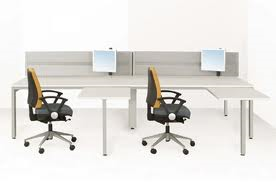 Netcom design, supply and install many types of bespoke benching. (Below are just some). Our multi-functional security trolley is designed for storing, charging and transporting tablet/laptops devices when they are not in use. 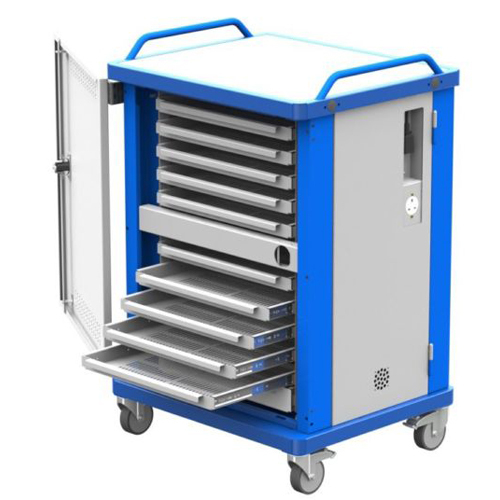 Created to manage the growing use of tablets in education and business environments, the trolleys offer a dependable means for ensuring the devices remain fully functional and safe from theft. The trolley is equipped with a plug socket for each individual tablet, cushioned compartments to separate each device, and a three point-locking mechanism on the front door to prevent unauthorised access. Our trolley is also available as a syncing model, which enables data to be synchronised between devices whilst they are charging. Personalised for ALL tablet devices including the Apple iPad, Google Nexus, Amazon Kindle, Samsung Galaxy and Microsoft Surface Tablets. For each model the frame of the trolley will remain the same, but the drawers may be adapted in depth to accommodate the different devices. 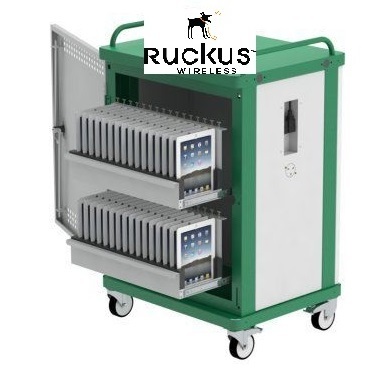 The fully mobile interactive wireless classroom is a complete wireless system for tablets or laptops utilising the latest Ruckus wireless hardware. The Trolley will allow you to take your classroom anywhere. This has been created to keep budgets low and change any classroom into an ICT room. 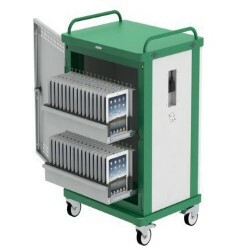 The wireless classroom trolley is a multi-functional security trolley designed for transporting a whole interactive classroom to anywhere you would like to teach, due to our access point you with be able to connect to the server from anywhere around the school. You are able to store, charge and wireless transporting tablet or laptop devices when they are not in use. 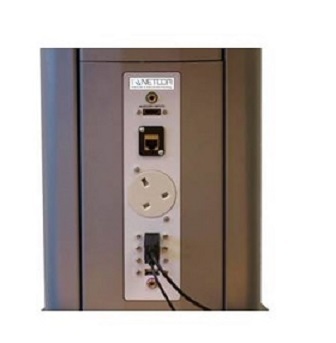 Created to manage the growing use of tablets and laptops in education and business environments, the fully mobile interactive wireless classroom offer a dependable means for ensuring the devices remain fully functional and safe from theft. The fully mobile interactive wireless classroom trolley is equipped with a plug socket for each individual tablet, cushioned compartments to separate each device, and a three point-locking mechanism on the front door to prevent unauthorised access. Accommodates all tablet devices including the Apple iPad, Google Nexus, Amazon Kindle, Samsung Galaxy and Microsoft Surface Tablets. For each model the frame of the trolley will remain the same, but the drawers may be adapted in depth to accommodate the different devices.